Divi Monk Layout Cloud Lifetime Access - only $59! Divi Monk is a nifty plugin that you can install and get access to professionally designed, conversion oriented full page templates, sections and module preset. Update Mar 20, 2019 : Divi Monk lifetime deal is back! The deal was expired in last year after we sold 300 copies within few months. We convinced IdeaBox Creations, the team behind Divi Monk, to bring back this popular deal one last time. With this package you get instant access to, 125+ FULL PAGE LAYOUTS , 130+ PRE MADE SECTIONS , 80+ READY TO USE MODULE DESIGNS. Read more about some of the layouts included, Learn how to build a stunning photography website with Divi Monk | Florist Business Template | Restaurant Template. Now is the best time to grab this library of ever growing Divi Layouts. Update May 24, 2018 : 37 new section templates are added. You are a Divi web designer and you have a quick design job. You are looking at all over internet to find inspirations. 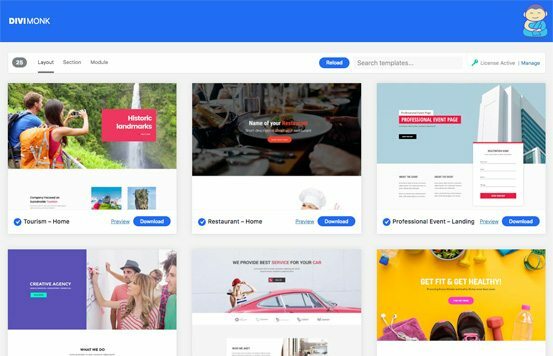 While searching you are thinking to yourself why isn’t there a ready made Divi layout solution so I can browse through the catalog and select one that fit to client’s requirement. Then all I need to do is change imagery, add some text and voila job done.. Client is happy and I saved ton of time that I can use for more time consuming jobs. Official Divi layout library is built exactly for this purpose but more ready made Divi layouts you have the more options you have to use for client work! Its always good to have your own custom portfolio of ready to use/Done For You Divi layouts. Today we bring you a tool that we think is a must have for any Divi web designer. The plugin is call Divi Monk and it’s only gonna cost you 59 bucks for LIFETIME ACCESS. If you go to their site now and check pricing you will see the lifetime package is sold at $299. We were able to negotiate and get very few exclusive discount codes or you. One of the unique features of the plugin is white labeling feature. When using it on a client site, you can rename the plugin, developer name, URL etc from Divi Monk branding options. It also fully WordPress multisite compatible so you can provide this service as a DIY web building solution. So what are you waiting for? This is one of the best investments you can make for your Divi web design business. Very few number of codes are left so grab your copy now! 4. Click on buy now button for Lifetime package. 5. In the checkout window you will find a field to enter your discount code – “Have a discount code? Click to enter it”. Once entered the price should go to ‘$0’ so you need not to make any additional payment. 7. Enjoy your lifetime access!